The Leopold Art Museum in Vienna is a monumental, classical building in the midst of monumental classical buildings, solid and imposing among Vienna's tributes to the Hapsburgs, to the Enlightenment, to itself. The square asserts its calm power, but inside the Leopold the less respectable paintings of Gustav Klimt and Egon Schiele are on display. 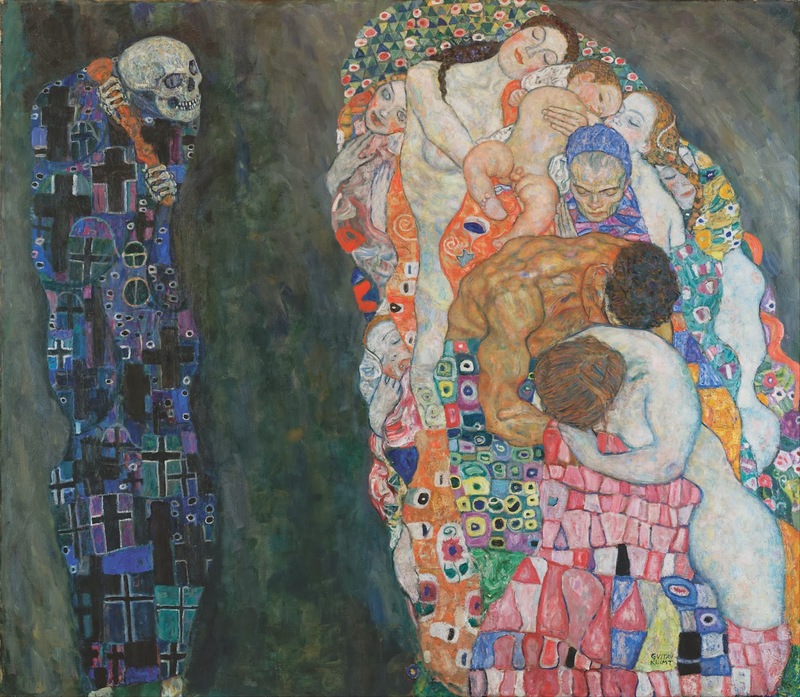 In the first two decades of the 20th century, a span of time that ended disastrously for Austria with the Great War and collapse of the Hapsburg Dynasty, Klimt and Schiele painted their unsettling body of work. Klimt was the older by almost 30 years, Schiele his brilliant protégé. They died within ten months of each other, in a 1918 that marked the vanishing of a generation, the end of the Austro-Hungarian Empire, and a change in temperament and world-view that one might say ushered in the Modern Age. At any rate, the world changed forever, and Klimt and Schiele did not survive the change. The paintings, of course, survived magnificently. Klimt's work is a triumph of composition and repose, of the filled canvas and disturbing undercurrent—sometimes hardly an undercurrent, as in his 1915 Death and Life, which you can see at the Leopold. 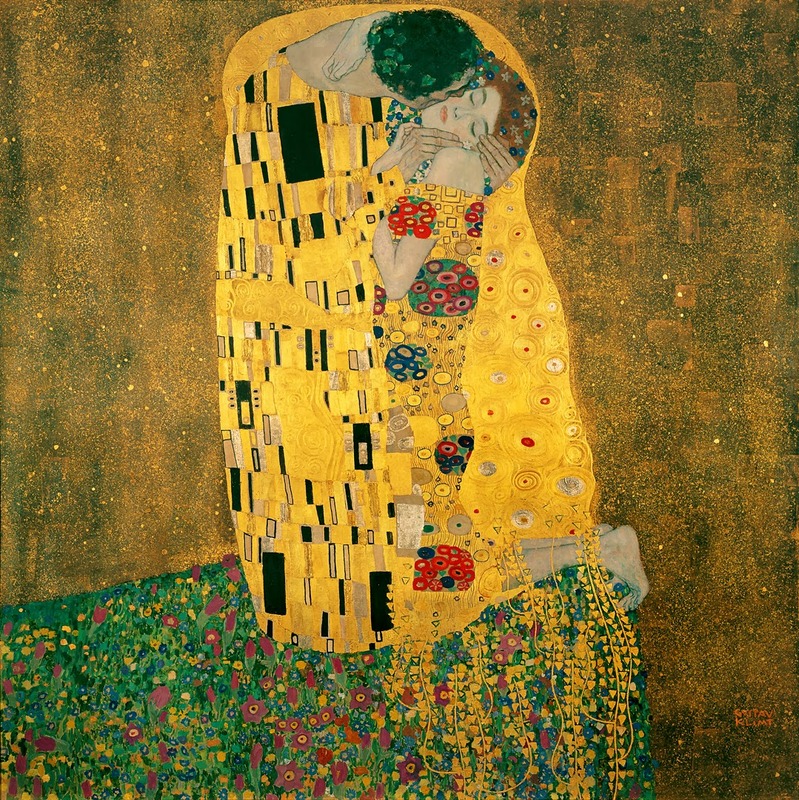 There is a compression in his imagery that is almost claustrophobic: his Kiss (at the Belvedere rather than the Leopold, but famous in his body of work) seems to flatten the image of its couple, calling attention to its own two-dimensionality and rendering the kissing couple bunched and uncomfortably tangled. In both cases there's hardly a space to breathe in the composition: Klimt smothers the eyes with pattern and paint, and standing in front of these paintings feels like a surfeit, as though it is all too much, as though Klimt is trying to strike the beholder with a decadent abundance. The paintings are beautiful in design, color, and form, but it is uncanny beauty in that the familiar images are made strange by their sheer lushness. 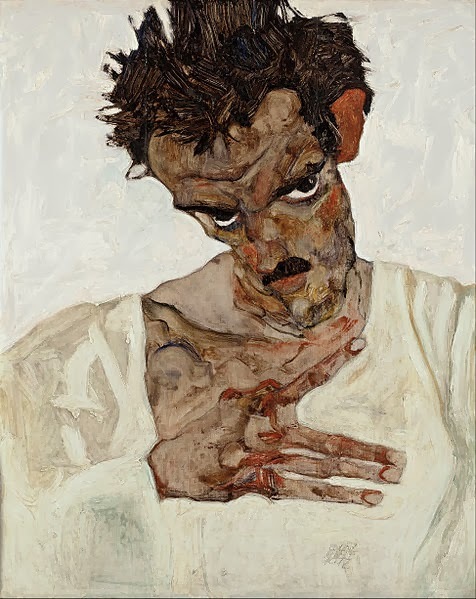 Schiele's paintings, on the other hand, are aggressive, confrontational. Imprisoned for "pornographic drawings at the height of a controversial career, he strikes alliance with the marginal, the outcast, the insane. 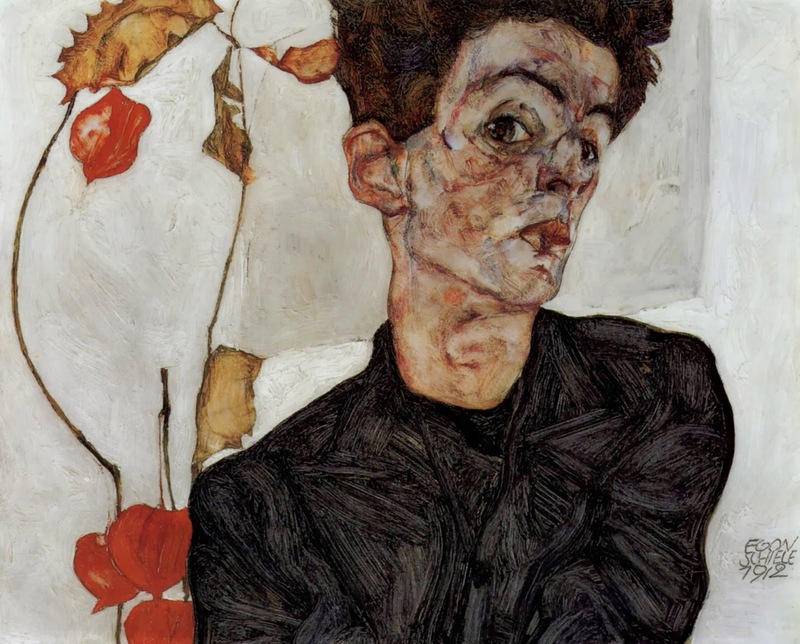 He has as many self-portraits as, say, Rembrandt (who is famous for self-portraiture), but where Rembrandt mercilessly records his own decline from strapping young man to a paunchy old age, Schiele doesn't live long enough to show us an aging artist. Not that such a subject would interest him, his portraits glaring at you with a kind of sudden, surprising menace, as though his head has just popped into the frame to look at you in defiance. Self-absorption? Hardly. It's more a mapping of the inner landscape, a projection of raw emotional menace. There's almost the Taxi Driver challenge ("You talking to me?") in his expressions, like his gaze is disrupting the "fourth wall" of the painting and staring back at you like some peeping tom, some intruder perched at the edge of your soul's privacy.